It’s been awhile since I posted about any organizing I’ve been doing, but over the last couple weeks, I’ve worked a bit on whittling down my mess some more; decluttering, organizing, and putting things away, or sorting things out to get rid of. One of the things I did was reorganize my thread. As a longarm quilter, I use a lot of thread, and it’s important to keep it organized so that I know what I have and what I might happen to need at any given moment for customer quilts. After a month of marathon quilting and traveling, it had gotten a bit out of hand, so I took the time to bring it back under control. I even destashed a few cones I knew I’d never use. Make note of any types or colors you might need to get. Organize and properly store your current supply. Make a conscious effort to use up any odds and ends leftovers so you can get rid of them. 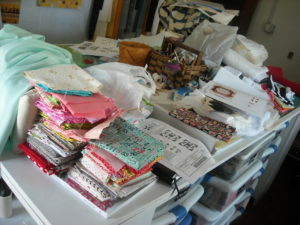 If there’s some you know you’ll never use, destash it somehow, or give it away to a fellow quilter that you know will put it to good use. Here’s the thread rack next to my sewing machine, carefully being watched over by none other than The King himself! I used to have three of these full, and I’ve used up and given away enough of it that I can make do with only one rack now, freeing up lots of wall space and alleviating lots of “thread guilt”. 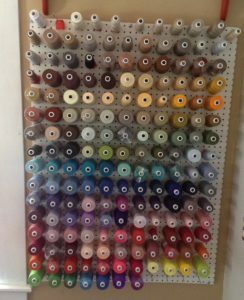 Here’s my wall rack with all my longarm thread colors. I use mostly OMNI by Superior Threads, but I have other threads stored in the cabinet in my longarm room. So . 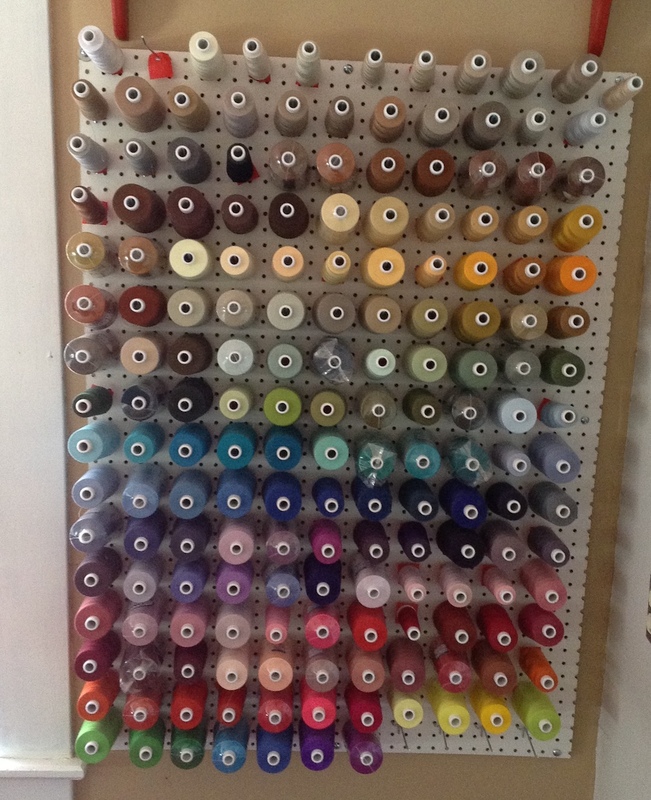 . . how do you store your different types of thread? Is your supply in need of some tidying up? And speaking of tidying up, dare we get into a discussion of how our cutting tables look? Mine is disastrous right at the moment! I feel another organizing challenge coming on . 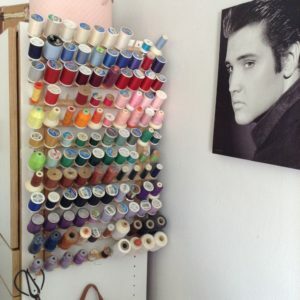 . .
hahahah I LOVE that you have Elvis watching over your thread rack. I store my thread in a hanging, clear plastic shoe bag. It is out of the sun! I stitched up the openings a bit so I can fit two spools in each side. My machine used to be in a shop where it was very dusty. This protects the thread from accumulating dust and I can easily see what I have. No comment on my cutting table.. working on clearing my dining table one UFO at a time! look out for those aliens…THEY HAVE INVADED!! I guess I’m one step ahead – I got very frustrated with my thread drawer a couple of weeks ago, and spent the day emptying and resorting. I now keep my quilting threads in an easily accessible drawer, sorted by thread size. My embroidery thread is kept in another part of my sewing room, in containers, and my regular sewing thread (for garments, etc.) are now in a bottom drawer. So far, it seems to be working, and I can find what I want! Durn. The trouble with straightening and organizing is that first you have to drag it all out. My place is in that state right now and I don’t know quite when I will get time to put it all away. Sigh! Oh and lucky you folks who have a cutting table. I have a card table that fills this role sometimes. Maybe I am the lucky one. If I had one it would be loaded no doubt.